SES S.A. (Euronext Paris and Luxembourg Stock Exchange: SESG) knows how to put to use their fleet of over 50 satellites, extensive ground infrastructure of over 20 teleports and more than 6,000 points of presence with their seamless roaming for vessels on the oceans. The company has announced the launch of its global SES Maritime+ service that will deliver high-speed connectivity to vessels traversing oceans. SES Maritime+ will enable maritime customers to have easy access to customizable bandwidth and coverage packages, ensuring satellite capacity is effectively utilized. 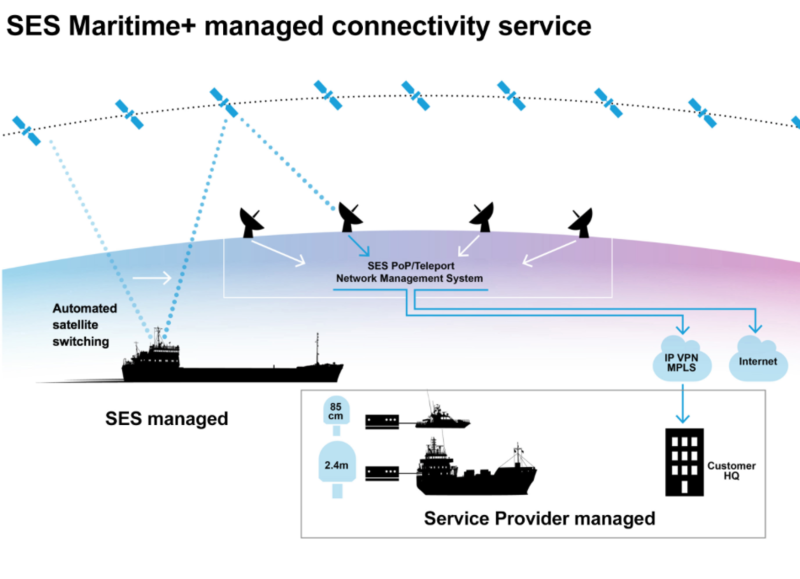 The managed connectivity service combines SES’s global network infrastructure and hybrid satellite capacity with the latest technology from VT iDirect, enabling SES customers to deliver a complete platform solution to maritime users on a worldwide basis. Commercial benefits include customized service level agreements and scalable throughput options, with standardized pricing regardless of region or season of operation. The global SES Maritime+ product is part of SES's enhanced data network, SES Plus, which is offering customized products and solutions to tackle the evolving needs of the mobility and enterprise markets. In March of this year, a regional Ka-band Maritime+ offering was unveiled specifically to target Europe.